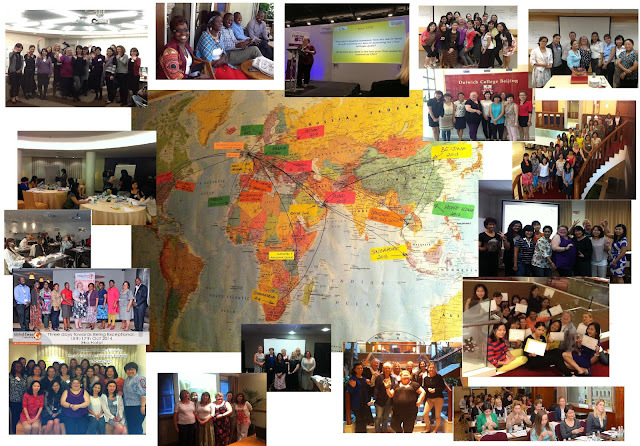 Angela Garry's PA & EA Blogspot: Working with PAs & EAs worldwide.... can you spot yourself in one of my course photos? Working with PAs & EAs worldwide.... can you spot yourself in one of my course photos? I've just been spending an hour or two pulling together some images to use in a promotional banner, to advertise my training courses. Going through my folders of photos has taken me ages - because for every image, I've stopped, looked at the faces, remembered some of the names (but not all, I'm good but not THAT good) - and remembered the stories they shared within the courses that they attended. In just five and a half years (during the first four years of which I was already carrying out a full-time job), I've met and delivered training, mentoring and / or coaching for well over 3,000 Personal Assistants, Executive Assistants, Secretaries, Office Managers, Admin Assistants - support staff by whatever name or title you choose to call them. I'm not sure I can express in words how lucky, fortunate, hanging-out-of-my-pockets-with-joy this feels. I just know that I've spent the last two hours or so with a great big grin on my face, remembering. Here's the combined image that I've put together, to be displayed in the middle of a vertical banner advertising my Pica Aurum training courses: can you spot yourself???? ?